What is a Nevada Month to Month Lease Agreement? Nevada Month to Month Lease Agreement: What Is It? 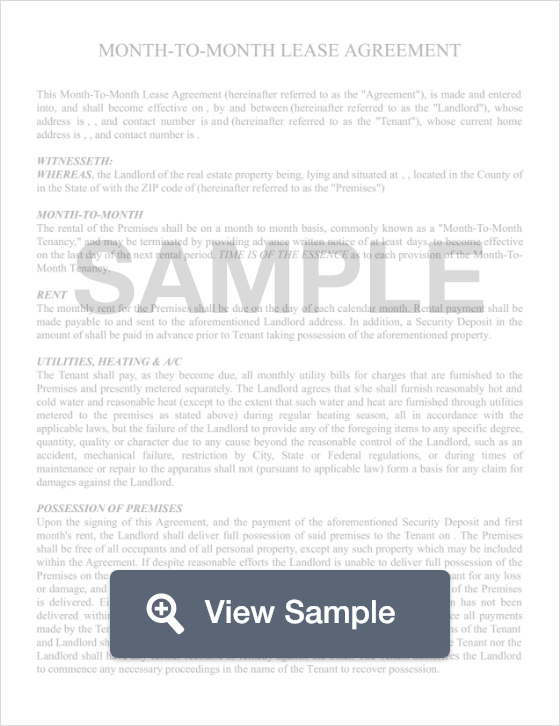 In the state of Nevada, a month to month lease agreement is a document that landlords use to procure a tenant in a monthly lease. These documents differ from traditional long term leases in the sense that they are only valid for a period of one month. However, once the month is up, the lease does not expire. Instead, the lease renews at the beginning of the next month and continues to do so until either the tenant or the landlord terminates the lease. Month to month leases contain the same essentials as a long term lease agreement, outlining important details such as rent due dates, rent amounts, rules of occupancy and other important information. When either the tenant or landlord is ready to terminate the lease, they may do so with a termination letter delivered to the other party no later than 30 days before the effective date. In Nevada, tenants or landlords who wish to terminate a lease may do so with a termination letter at least 30 days before the termination.